Here are a few things HR and business leaders should keep in mind while designing a digital strategy to ensure effective communication. Among the many buzzwords revolving the HR community today is 'Employee Experience'. Moving beyond the concept of engagement, organizations are looking for ways to create an awesome experience for employees across the various stages of the lifecycle. One of the most important elements that lie at the core of creating this incredible employee experience is 'communication'. How companies communicate and engage with their employees have evolved and transformed in recent years. Many new tools and technologies largely led by AI and ML have replaced traditional modes of communication. Chatbots allow employees to find answers to their problems and the centralized app helps employees communicate with their team and leaders remotely. While the modes of communication have advanced, organizations still struggle to engage with their employees efficiently. Where are the organizations going wrong with their digital communication strategy? To identify the factors that lead to this communication gap and to learn some ways in which digital solutions can be utilized in a more efficient way, People Matters and Fountainhead Digital MKTG organized a breakfast Roundtable. 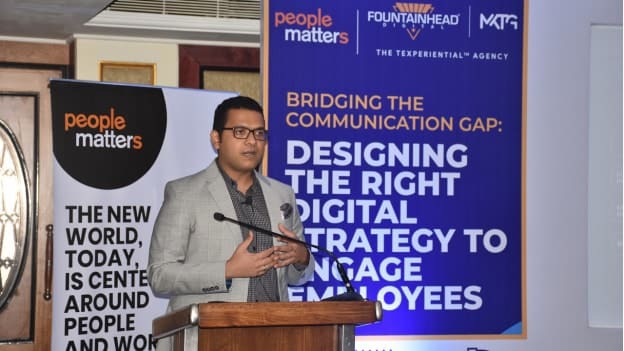 In a conversation led by Thapas Joseph, President - Fountainhead Digital MKTG, HR leaders from diverse industries came together to discuss what it takes to design the right digital strategy to engage employees. In a keynote session, Tathagata Basu, Group Head - Learning & Talent Management at Piramal Group also shared his company’s journey of designing an effective digital communication strategy. Most of the solutions that organizations are building are for employees and for solving people and work-related challenges. But how often do they make the effort of understanding the needs and challenges of employees? A good amount of time and effort should go in the planning stage and in building a strong foundation. Ask each employee about the challenges they face specifically related to communication. Strong feedback on already laid out processes is also one way to gather more insights. Through feedback, leaders can identify the gaps in effective communication and re-work on them accordingly. For an organization with employees spread across various geographies, the communication-related challenges would be different from an organization that has the entire workforce working in one space. Further, the industry and the ecosystem the organization operates in will also impact the communication strategy. Hence, before leaders look outside for available digital solutions trending in the market, they should first gain more clarity about their organizations' need. For instance, for a geographically spread workforce, an integrated mobile app is the best solution. But for a similar, yet a different case where the employees operate from different remote areas and face connectivity issues, an app might not be the best solution. For them what might work are things like a data pool, FAQs and documents that they can refer to offline as well. Understanding and knowing the employees' and organizations' need is key to designing a successful digital communication strategy. Then the next step should be hyper-personalizing the communication once crafted. This would enable the organizations to make their digital communication tools more relevant without losing the human touch. An HR professional’s job does not end at introducing and launching a digital solution. It's essential to involve employees at each stage of building and implementing a digital strategy. To begin with, the work becomes easy when the solution is as per the employees' need. But then later while introducing the solution it is also necessary to let employees know the benefits of the app or the chatbot that is being launched. Answer the 'what's in it for me' for the workforce and they will feel more valued and hence be more engaged. The whole step by step approach to designing a digital communication strategy and an open and inclusive outlook will help organizations create a good employee experience for their employees. What keeps the tech workforce at work in India amidst public scandals?